Caution - If necessary, use two people to dismount and carry the chassis. See Power Off the Server (Service Processor Command). 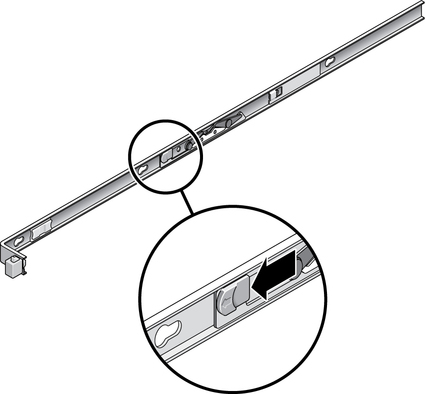 Press the metal lever that is located on the inner side of the rail to disconnect the cable management arm (CMA) from the rail assembly, as shown in the following figure. The CMA is still attached to the cabinet, but the server chassis is now disconnected from the CMA. 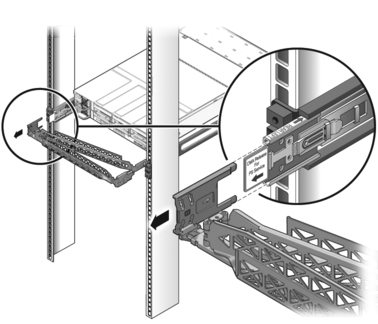 From the front of the server, pull the release tabs forward and pull the server forward until it is free of the rack rails as shown in the following figure.